name 5 things. : Craigslist Scores. I recently came across two Craigslist finds that rival my Craigslist bar cart score. I found both of these pieces within 3 days of each other. First up, the coveted campaign dresser. I have Pinterest to thank for this find. I saw a pin with Craigslist search tips, so of course, I clicked on it and saw you have the option to "show images." Who knew this, by the way? I've been searching Craigslist forever and had never seen that option before. I was skeptical that it was really even there, so I did my usual "dresser" search to test it out. And lo and behold, images showed up (albeit tiny)! 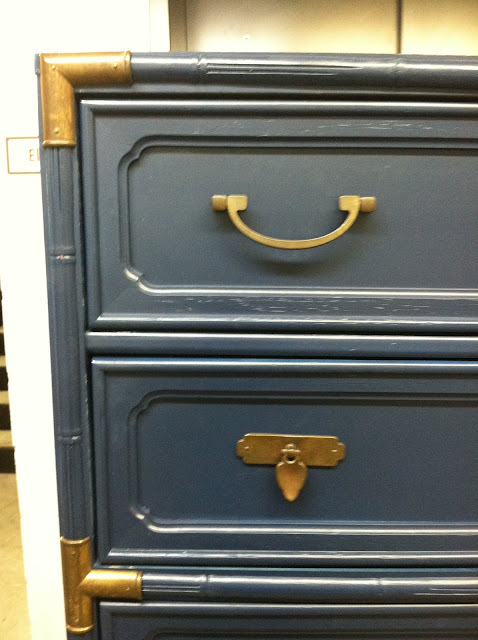 While I was there, I perused the images and thought I could make out a campaign dresser from a super fuzzy image. I was right! And it was $75! I could hardly contain my excitement when I first saw it in person. We ended up having the perfect place for it in our apartment, and it's great for some extra much needed storage. Here it is in all its glory! The dresser isn't in the best shape, but it isn't terrible. It has some nicks and scratches on the top and on the front (hence the placement of some of the accessories). I don't know where I'm going to put it when we move, so I'm not making any final decisions, but I am thinking I will end up painting it. And you may have noticed that it's missing a drawer pull. Thankfully, I was able to find one online that appears to match perfectly and should arrive shortly! Aren't those carnations so pretty? I bought them over a week ago and they still look beautiful! I love the fun bright colors. The pink and white striped tray is a recent find from Ikea. The dresser totally needs some help in the styling department (and doesn't work the best on the hardwoods), but I am working with a very limited number of accessories I brought over from the house. Everything else is in storage, including a lamp that would be perfect for the space. But oh well. It will be like Christmas when I get to unpack the boxes in storage! As for my second find . . . a beautiful bamboo dresser. Excuse the quality of the pictures. I took them on my iPhone as we were loading the dresser into our storage unit. Sadly, we don't have room for it in our apartment, but we will be reunited again! The dresser has been professionally repainted in a gray/blue color. The lady we bought it from said that after she had it painted, her husband didn't like the color of it. Too bad for her because this piece is gorgeous. Again, I don't know where it will go in the new house (assuming we ever find one), but I am actually digging its current color. How fabulous is the hardware? And a big shout out to Justin for putting up with my Craigslist searching and going to load up the furniture for me. I would like to say I won't search anymore until we find a house, but old habits die hard! Those dressers are both awesome! Fun you can at least use one in the apartment! I have campaign envy now. I had no idea about the craigslist photo thing, that is BRILLIANT!!! 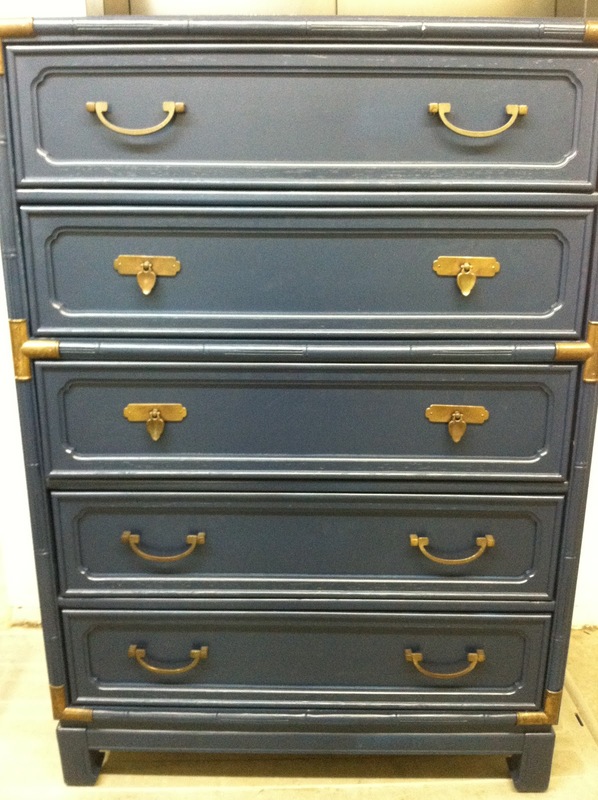 So much easier to find the things that you're coveting (c: And speaking of coveting...I'm dying over both those dressers. Amazing. Wonderful. Perfection (c: I can't imagine how anyone could ever get rid of them, but I'm glad they did! What great scores! I love the gray dresser. Those are fantastic finds!!!!!! Love! you lucky duck!!! those are awesome!! I've been searching for ages too! those are both pretty awesome! I'm still sad about my campaign dresser disappearing out of my garage. Do you use craigseasy? I sometimes use the little teeny photos on CL, but craigseasy has much bigger pictures and is easier to use, I think. I never find anything on Craigslist. Seriously. I need you as my Craigslist personal shopper! This is totally reviing my need to craigslist search, along with seeing a friend's craiglist find this weekend (2 armchairs that are the PERFECT scale and size for MY living room haha)...your finds are just absolutely amazing!! Who finds 2 dressers in one shot? Better question: who finds a professionally painted piece with sweet hardware??? Well done Sherlock Holmes! Cut it out! Those are terrific scores. I can't believe someone was willing to part with them. Lucky you! those are definitely great finds! You scored BIG time!! I have been off of CL for a while now but think I am ready to make the plunge again :) This totally inspired me! Those are some amazing finds! Check out all that gorgeous hardware! The bamboo dresser is AMAZING! I love everything about it! Wow...major score!! Totally in love! LOVE the bamboo dresser!! Way to go girl!